Battery life is one of the significant factors that we look at when choosing a mobile device. Of course, we want our smartphones or tablets to be able to keep up with heavy usage and hopefully last the entire day. While most of the newer phones are now made with more significant battery capacities, the additional juice usually ends up powering other features — for instance, a more prominent display means more power is drawn from the battery. The need for longer battery life is the reason why Android task killer apps have been developed. They are the rage back in the day, but are they still relevant and useful today? 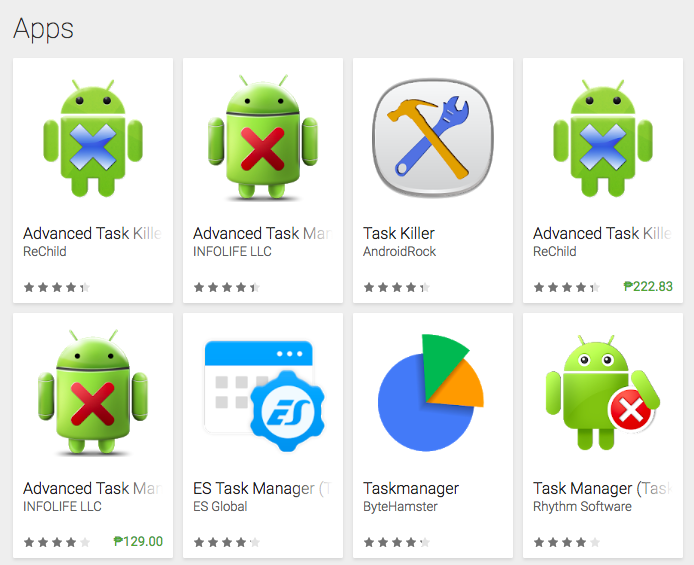 What is an Android Task Killer App? A task killer app is a third-party mobile app designed to force-stop apps and processes running in the background. This activity is supposed to free up the device’s system memory or RAM. Necessarily, they “kill” apps, thus the moniker. Some apps of this kind are made to function automatically in timed intervals, while some will be triggered if it detects heavy RAM usage. There are also those that require manual user intervention. Some even let the user choose which of the listed apps to kill. Furthermore, several task killers have more customizable features. Task killers became popular back when complaints about the short battery life of mobile devices were growing. The concept of using a task killer is that by forcing apps and processes to stop, they are lifted from the memory. As a result, the Android phone or tablet’s CPU has fewer things to process. That means it consumes less energy, helping the battery last longer, possibly throughout the day. Over the years, task killers have been met with skepticism. Despite developers doing their best to back their claims and users swearing by the benefits of apps they were able to use, there are still opposing arguments regarding the need for these apps and their value. Some claim that the Android operating system has already grown and has tremendously improved through the years and is now far more capable in handling every process thrown at it. Some also argue that the memory and CPU of mobile devices work differently from that of computers. Additionally, mobile hardware has come a long way to support software processes better without consuming a lot of energy. All these arguments boil into one: Android task killers are not as necessary as they are being fashioned to be. So, Should You Use a Task Killer for Android? Most task killer apps provide a detailed graph and data about apps and processes. It lets you see which of them often use too much processing and battery power for no useful and apparent reason. As a result, you can uninstall these apps and maybe find a better alternative. Mobile phones and tablets running on older Android versions can still benefit from task killers’ primary function as they have less process management capabilities compared to newer devices. Even if you can force-stop apps and processes through the Application Manager, you’ll have to do it manually for each app. Task killers let you force-stop apps in one go. It is especially helpful if there are apps that are designed to continually try establishing an Internet connection and generate notifications, which aside from using up your mobile data are also draining your battery. Task killers can cause problems when they are not used and configured correctly. So, it’s a must that you learn how to use one and know which apps you can kill and shouldn’t. Every task killer app looks differently and may have different features, but they should have the same functions. All you need to do is familiarize yourself with the settings and find where you can make the changes. The most basic way to use an Android task killer is to open the app and manually select and kill apps. The process of killing an app is pretty straightforward. Usually, you’ll have to check apps from a list provided by the task killer, then tap a button to kill them. The trickier part is the selection. If you accidentally killed an app or process needed by your system or other connected apps to work smoothly, you might experience some issues. Apps that check for updates – You might want to keep apps such as Play Store active if you like to be notified of available app updates. Apps you use for events and other reminders – As exampled above, killing off apps designed to remind you of something may need to be kept running to avoid missing any significant event or task. Apps that are currently doing something important – If an app is currently updating, for instance, leave it be. Killing off an app during a crucial process may affect its overall performance. Often, you will also have the option to set a task killer to auto-kill apps. Now, this is where it gets risky. If you let your task killer just auto-kill apps without first setting it up yourself, it might not discriminate and kill apps and processes crucial for the proper functioning of your device and other connected services and apps. Apps and processes that has ‘android.’ in its name should never be killed. Apps and processes that bear the name of your carrier and device’s manufacturer should not be killed unless you are confident that they are just extra, stand-alone apps. If an app sounds too foreign or technical, it’s probably a system process, and thus shouldn’t be killed. Home replacements or launchers shouldn’t be killed, whether they’re from your manufacturer or downloaded from Play Store. If your task killer allows setting the interval or schedule of killing apps, fix it to do so as often as possible. Installing a task killer and not using it beats the purpose of having one. After allowing a task killer to manage your device’s apps and processes, pay attention to your device. Did it have longer battery life? Is it working just fine despite some apps and processes being killed from time to time? By the way, if your primary reason for wanting to install a task killer is to boost your device’s RAM and extend its battery, an Android cleaner app such as Outbyte Android Care can also help. This app is designed to clean out junk files and extend RAM, helping extend the battery for up to 2 hours.